If you were part of the party last week, thank you for joining us & welcome back. If you are new to the party, we’re glad you have joined us and are here to be part of today’s creative celebration. 1. Doesn’t this Salted Caramel Sauce look divine? Check it out at Craftbeering.com by clicking here. I think it will make an excellent gift for a few people in my life! 2. Loving these barn wood book shelves! Check out how easy this DIY project is at Grandma’s House DIY by clicking here. I’m inspired by all of the upcycle projects I’ve been finding like this one. 3. These No Bake Energy Bites from All that Jas are right up my ally. I have a couple of recipes myself & always pick up Lara Bites as an emergency back up for the car. Can’t wait to try these. Here’s the link so you can try them too. 4. I’m not totally ready to think Fall, but fell in love with this easy DIY sign. Flower Patch Farm House has inspired me to start thinking about those autumn days. Grab all of the easy tips here. NOTE: If you were featured, please grab our button & add it to your post that was featured. Now it’s on to this week’s party. If you’re a blogger please share your creativity & tasty bites by linking up below. We will send you a reminder next Tuesday for our next Reader Tip Tuesday. Have a great day…. Thank you so much for hosting, Jodie. Today I’ve shared an easy, seasonal Blackberry Apple Cake. Hope to see you at Hearth and Soul this week! Have a lovely week ahead. Jodie, thanks for your kind comments and warm invitation to join your party!! Your features look great and I will be sure to check out many of the links!!! Have a nice week. Thanks for the invite to join your lovely gathering here! I look forward to checking out, what looks to be, a wonderful collection of interesting links. Happy Tuesday! Gotta love salted caramel sauce! Thank you so much for the feature of our floating barn wood book shelves! It was my pleasure = LOVE THEM!! Love the features, especially the shelves. 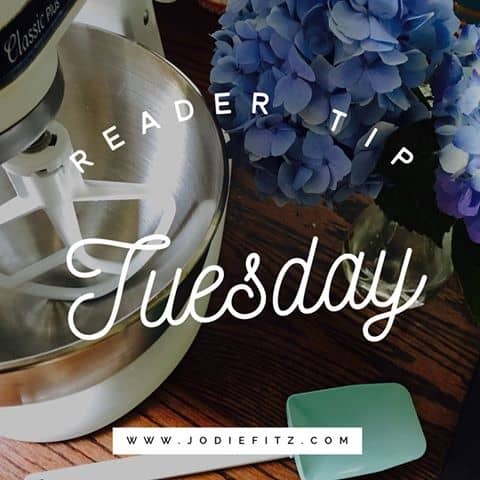 Thanks, Jodie, for hosting Reader Tip Tuesdays and the invitation to join in the fun. I look forward to checking out the other links. Thanks for hosting. Have a fun and blessed week! Thanks a million for the feature of our hops salted caramel sauce! Have a great week! LOVE the Salted Caramel Sauce :)…. Thanks for hosting! Have a blessed week! Thanks so much for the invite and for hosting! Enjoy the rest of your week! Thank you for the lovely invitation. I am delighted to join your fun party. It is wonderful to meet you. Salted caramel sauce, oh my! Thanks for sharing with SYC. Hope I have something to share some time. Yes, I know…I love salted caramel everything = YUMMO!